Good news from our friends at BBTS today, in the form of some long overdue new Marvel Universe pre-orders from Hasbro. Remember the Professor X wave that we reviewed back in early August? Looks like this wave will be hitting the US in February 2013. Details, rant and more hyperlinks than you can shake a stick at after the jump. It’s no secret that Hasbro has completely neglected the Marvel Universe line ever since laying off the line’s chief, David Vonner, almost a year ago. Not counting the Psylocke wave (which was technically wave 1 for 2012 but came out in December 2011), we’ve received a whopping two waves this year (wave 18 – the Beta Ray Bill wave, and wave 19 – the Kang wave). I got my hands on a case of what we were lead to believe way back at NYCC 2011 would be wave 21, which was due to hit in the second half of 2012 after the Nova wave (wave 20). Well, we didn’t even see waves 18 and 19 until the second half of this year, and there’s been absolutely no sign of the wave 20 (Nova), not even a pre-order. But the Professor X wave started showing up overseas and even in Mexico before Wave 18 even hit the US, so we know all this stuff is just sitting in a warehouse gathering dust somewhere. It would seem now that Hasbro has definitely swapped waves around and pushed some stuff back (after all, the whole whopping three new figures we saw at SDCC 2012 –Rhino, Elektra, and Mysterio – were said at the time to be the first wave of 2013). Thanks for keeping your loyal collectors and customers informed, big H. Holy hell has the company mismanaged this line since sending Vonner packing. Anyway, enough with the rant. If you’re one of the suckers like me still foolish enough to give these jerks your money, and you haven’t already acquired these figures from overseas, you can order the full case here, or just the set of three new figures here. The overseas cases contained one of each Blastaar variant, as well as the Bag Head and Miles Morales versions of Spidey. Take that for what it’s worth. Last but not least, BBTS also put up another MU preorder a couple days ago, albeit less descriptive. This is for the fifth wave of team packs, and the assortment looks to include the Inhumans set shown at Comic Con, as well as a previously un-announced West Coast Avengers set, and a “Super Team 3” set, which is obviously a placeholder title. 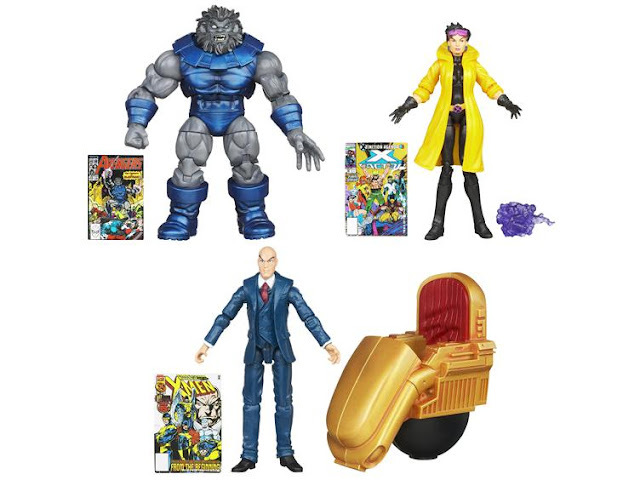 Maybe this is one of the two upcoming X-Men sets? No photos yet and the contents of two of these sets are completely unknown, but look for these to hit in January. Preorder the set of three here, or the case of four (with a second WCA set) here.